Is America no longer public enemy No. 1 on climate change? WARSAW, Poland -- The annual U.N. climate change negotiations often take on the flavor of an environmental war crimes tribunal, with America as the top offender. For the first time in at least a decade, activists have not awarded the United States a "fossil of the day" designation, with which it brands environmental miscreants and those seen as blocking progress in the talks. The Obama administration has won grudging approval for trying to mediate differences between Europe and developing nations on funding. And diplomats who have made it a habit to bash America at these discussions suddenly have some nice things to say. "There is a feeling among leaders here that there is movement on the part of the United States," said Marshall Islands Minister in Assistance to the President Tony de Brum. 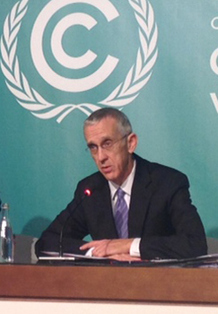 Todd Stern, the United States' chief climate negotiator, speaks at this week’s U.N. climate talks in Warsaw, Poland. Photo by Lisa Friedman. So frustrated was de Brum last year with U.S. inaction internationally that he called for Obama to replace his top negotiator, Todd Stern, with then-New York Mayor and climate champion Michael Bloomberg. But before this 19th Conference of the Parties (COP 19) to the U.N. Framework Convention on Climate Change began here this month, de Brum said, he had a long phone conversation with Stern about ways to bridge the divide between rich and poor nations on sticky issues. These days, de Brum said, there is an "openness" among U.S. climate diplomats "that would not have seemed likely even a year ago." U.K. Energy Secretary Edward Davey praised Obama's move to regulate emissions from coal-fired power plants and other domestic measures, saying the efforts have translated into a new dynamic internationally. "It is clear that [President Obama] wants to take action and be a leader on climate change," he said. "I don't believe there has been a COP where the head of a British delegation has said that about an American president before." Some working the corridors of the converted football stadium where talks are taking place say the United States looks good only in contrast to Australia and Japan, both of which are reneging on emissions pledges. And, others point out, any shift in tenor from Stern and his team has not translated into new positions that developing countries find more favorable. America's near-term pledge to cut greenhouse gas emissions 17 percent below 2005 levels this decade is far too low for the world's largest historical climate polluter, activists say, and it isn't likely to be ratcheted up. The United States also remains adamant that offering voluntary emissions pledges, which hopefully add up to avoid catastrophic warming levels, is the best way to fashion a new global agreement on the horizon for 2015. The delegation here in recent days has been accused of watering down an attempt to help vulnerable nations address unavoidable losses and damages from climate change, and has also declared that there will be no new firm pledges in Warsaw of aid for the most vulnerable. "Somehow, when they negotiate, they always find some way to excuse themselves from doing anything," said Lucille Sering, secretary of the Climate Change Commission of the Philippines. "It's always either they can't do this or they can't do that" (Greenwire, Nov. 19). Agreed Prakash Mathema of Nepal, who is leading negotiations for the least developed countries, "It's good that the country is acting domestically, but we want numbers. We want clear words, not vague promises." Yet the change in tone in Warsaw this year is undeniable. Those friendly to the United States say it stems largely from the Climate Action Plan that Obama unveiled in June, which calls for new carbon emissions limits on new power plants and other rules that -- along with an ailing economy and natural gas boom -- are putting the United States on a path to meeting its 17 percent target. With a successful 2012 re-election campaign now behind him, Obama is no longer shy about touting to the world the existing authority he is using on climate change in the absence of congressional action. That, too, has made a difference, said Harvard University economist Robert Stavins. "Before the election, they didn't want to talk about it," Stavins said, noting that the administration worried that speaking "too loudly" on the international circuit about plans to invoke regulatory authority on emissions would invite attacks from Republicans. "It is a situation now where the president is willing to do more in his last term, and we can really see more ambition than before," acknowledged Tosi Mpanu, who leads a group of African negotiators to the U.N. climate talks and in previous years has lambasted U.S. inaction. Iain Keith, a senior campaigner at the global online advocacy group Avaaz.org, said being able to show progress domestically has not only bought goodwill but also helped the United States tactically as it tries to push emerging big emitters to take on more responsibility. "Their whole diplomatic strategy has been not to promise more than they can do," Keith said. Now, "they can back up what they're saying at the talks with what they're doing at home." With two official negotiating days left in Warsaw, things could still go south for global opinion of the United States. But one senior European leader said that for the first time, it seems the administration "really wants to play ball and get something done" on a global 2015 deal. Many attributed that to Secretary of State John Kerry, a longtime supporter of the global talks who has made a point of raising the profile of climate action in the State Department and weaving the issue into his diplomacy. "People are picking up on the fact that the U.S. wants a deal," said Paul Bledsoe, a former Clinton White House climate adviser. "In talking to ministers, there is a recognition that the U.S. is serious." Perhaps more surprising is a softer tone and even an occasional "attaboy" from the most vicious U.S. critics: environmental and social justice groups. Oxfam's Tim Gore said that on the most contentious issues here -- finance and loss and damage -- the United States has tried to be constructive. "The tone and tenor of the negotiations has been quite positive [on finance] as in a number of other issues," he said. "The behavior of the Americans has really put them in a good light." Of course, how the next two years plays out remains to be seen. Jake Schmidt, international climate policy director at the Natural Resources Defense Council, noted that despite Obama's plan, diplomats still remember the United States' walking out on the 1997 Kyoto Protocol it helped craft. Many are still holding their breath to see if the United States really comes through domestically and internationally. "Those wounds are very deep in countries," Schmidt said. "They get that the dynamic is different in the United States than it was before, but they're not going to give them praise just yet."